It can be humbling to write a bi-weekly newspaper column: Few things more effectively highlight one’s capacity for change – or inconsistency, denial, and flip-flopping. I’m not convinced that this is a bad thing; isn’t the point of individual human existence to grow and change? Isn’t it natural that the ideas expressed in a column should evolve along with the human writing that column? For some reason, though, we expect writers – particularly writers of regular columns – to emerge with a fully formed set of ideas that remain consistent for the life of their column. Writing, it seems, sets one’s opinions in cement, and to deviate from a previously written opinion is to reveal a weak character. If that seems extreme, imagine Ann Coulter suddenly begging our forgiveness and espousing the ideology of the liberal left, or Nicholas Kristof announcing that he’s been wrong and human trafficking is really just a natural extension of free market capitalism. One scenario might be wonderful, one might be awful, but each would call into question the journalistic integrity of the writer. 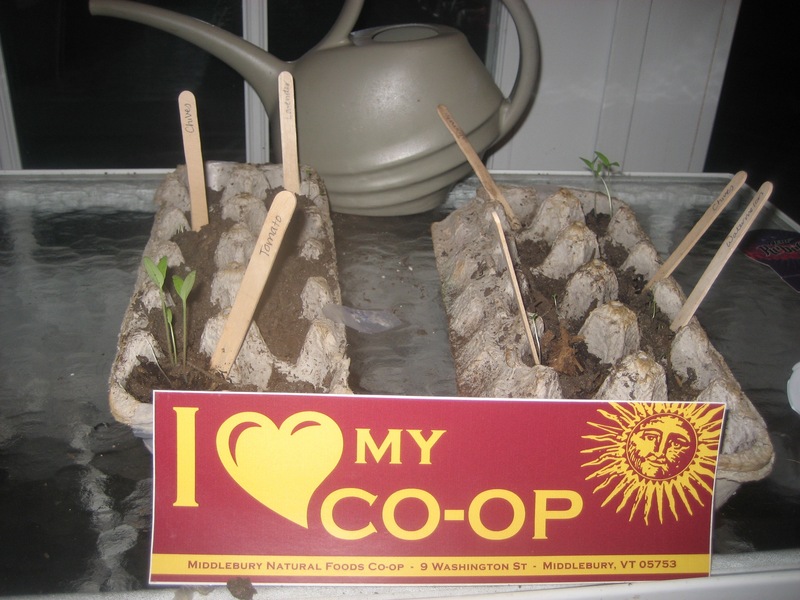 Last month, we joined the Middlebury Natural Foods Co-op. I changed my mind. Yes, I still shop for some items at Hannaford’s and Shaw’s. Yes, some of this change may be due to having older children. But the bulk of the change happened in my mind, where the benefits of supporting local agriculture and healthier foods began to outweigh the inconveniences. Once we joined the Co-op, it was as if the floodgates opened; my husband and I started plotting more direct ways to support local farms. For several years we’ve enjoyed fresh vegetables from June through October through an Elmer Farm CSA share; Elmer Farm is minutes from our house, and it’s become a family event to stop there every Wednesday for our produce. Now, we started noticing other farm stands where we could buy cheese, eggs, and meat. We purchased a small, used chest freezer from a friend. The freezer stands in our garage, where it currently houses eight of Isaac Behrens’s free-range chickens, pastured at Elmer Farm. Soon it will also be home to my husband’s Father’s Day gift: half of a local, humanely raised cow from Green Pasture Meats. It gets worse: We’re also planning to grow and raise more of our own food directly. In a few weeks, we’ll harvest our first blueberry crop. The raspberries are next. We’ve got tomatoes and pole beans thriving in pots on our deck. And, in a gesture of tremendous hope, I’ve put in a small raised-bed garden on the tiny spot of our yard that gets full sunlight. I suspect that a second attempt at laying hens is in our near future. What changed? What turned me from a consumer of cheap, processed food, to a convert of local, sustainable agriculture? The answer is: writing. Writing by writers with more fully formed opinions, politics, and lifestyles than me. My guides have been E. B. White (One Man’s Meat), Wendell Berry (The Gift of Good Land), Forrest Pritchard (Gaining Ground), and Ben Hewitt (The Nourishing Homestead). So I’ve started to consider the money I spend at the Co-op, at local farm stands, and on Vermont-raised, grass-fed meat as an investment. It’s an investment in knowing that the food I’m feeding my family wasn’t sprayed by toxic chemicals or confined in inhumane conditions and fed an unnatural diet. It’s an investment in Vermont, because I’d much rather see farms than mega-marts dotting our landscape. And it’s an investment in our children: in their health, their world, and their values. Now, when we sit down to dinner, my husband likes to tell our daughters where every food on the table came from, because he can. Don’t worry: I’m not going to get too preachy on you. She quickly added, “We don’t hurt nature, except ants and mosquitoes.” I’m negotiating with her to include mice on that list, as well.